Description of "The Last Post: Inscriptions on French Graves in India"
While some of the British cemeteries in India are well known, not much is known about the Portuguese and the French cemeteries in India. This work deals with the French cemeteries and graves in India. Major French cemeteries in India are located in the erstwhile French colonies in India- Pondicherry, Karikal, Chandernagore, Yanam and Mahe, while there are also some scattered onces in different other places. These include graves of Jesuit Priests, Sisters of Cluny and Sisters of St. Joseph of Tabres. This is an attempt to create a data base of the inscriptions on the French graves in India. K.J.S.Chatrath retired from the I. A.S. in 2003. He holds a Ph.D. from the University of Paris for his thesis on the ‘Indo-French Diplomatic Relations’. He has authored a number of books – mostly on the France-India interface: ‘The Foreign Policy of France’, ‘India in the Debates of the French Parliment: 1945-1988’, ‘Ver la Lumiere: A Study of the French School System’, ‘France - A Brief Bibliography’, ‘A Glance at France’ and ‘The French Collection’. Presently he is working on his next book on the erstwhile French Loge at Balasore in Orissa. Besides France, his other interests are travel and trekking. He stays in Panchkula and can be contacted at chatrath@gmail.com or through his website: www.europeangravesinindia.com. THE MOORS IN SPAIN by EDITED BY FAHEEM JUDAH-EL D.D. 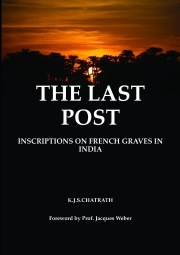 Reviews of "The Last Post: Inscriptions on French Graves in India"